Ahmedabad: Solar Impulse, the world’s only solar-powered aircraft, will make a stop over in Ahmedabad tomorrow as a part of its maiden global journey. “Solar Impulse will take off from Abu Dhabi in the United Arab Emirates and land in Ahmedabad after making a first stop over at Muscat in Oman. It will make a pit-stop in Ahmedabad,” a release issued by the aircraft project’s PR firm said here. After making a landing here, the solar-powered aircraft’s founders and pilots Bertrand Piccard and Andr? Borschberg are likely to stay in the city for two days before leaving for Varanasi in Uttar Pradesh, the release said. 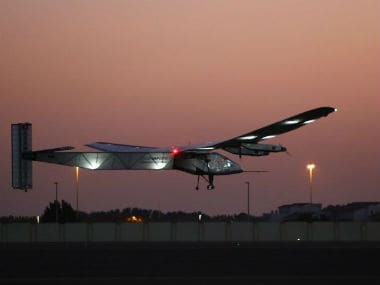 The Swiss solar-powered aircraft’s flight got delayed by a day due to bad weather conditions in the UAE. The aircraft was scheduled to land in Ahmedabad today, but now it will make a stop over here tomorrow, it said. Piccard and Borschberg, during their stay in the city, will reach out to the government, NGOs, universities and schools to spread the message of clean technologies. The aircraft is also likely to hover above Ganga river in Varanasi to spread the message of cleanliness and clean energy, an official associated with the project said. Solar Impulse is claimed to be the first aircraft to fly day and night without a drop of fuel, propelled solely by the sun’s energy, as per the project’s website. The single-seater aircraft made of carbon fibre has a 72 metre wingspan, larger than that of Boeing-747 and weighs just 2,300 kg, equivalent to the weight of a car, it said. The 17,248 solar cells built into the wing supply electric motors with renewable energy. The solar cells recharge four lithium polymer batteries totalling 633 kg each, which allow the aircraft to fly at night and therefore have virtually unlimited autonomy, it said. This round-the-world flight will take-off from Abu Dhabi and make a halt at Muscat (Oman), Ahmedabad and Varanasi in India, Mandalay in Myanmar and Chongqing and Nanjing in China. After crossing the Pacific Ocean via Hawaii, the aircraft will fly across the US stopping at Phoenix, the Midwest and New York City, said the website. The test flight of the aircraft was conducted in the US in 2013.